As cinematic enigmas go, you would be hard pressed to find one more deliberately obfuscating than Lisandro Alonso's Jauja. Yet far from hampering one's enjoyment of the film, its seeming impenetrability and its hazy thematic content deepen one's engagement with the work. Part of the beauty of this film lies in its mystery. Alonso doesn't want us to understand what we're watching so much as feel and contemplate it. Jauja is a film that seems to exist outside of time and place. It begins in the 19th century, as a father and daughter join a military caravan searching for the mythical city of Jauja, which, according to South American folklore, is a land of eternal youth and beauty. Like the fabled Fountain of Youth, man have set out in search of Jauja, but none have returned. Gunnar Dinesen (Viggo Mortensen) is a Danish engineer contracted with the Argentinian military. His 15 year old daughter, Ingeborg (Viilbjørk Malling Agger), is the only woman in a barren land full of men, and as such begins to attract attention, both wanted an unwanted. The group's commanding officer ask's Dinesen's permission to court Ingebog, much to Dinesen's disgust. But Ingeborg isn't interest, turning her affections instead toward a young soldier named Angel (Esteban Bigliardi). Viilbjørk Malling Agger & Esteban Bigliardi in a scene from Lisandro Alonso's JAUJA. When Ingeborg and Angel's relationship begins to attract attention and jealousy from his fellow soldiers, they decide to run away together, stealing off quietly in the night. Not prepared to give up his daughter, and afraid for their safety in a wild and dangerous country, Dinesen mounts his horse and rides off into enemy territory in search of the young lovers. There he will face bandits, indians, and ultimately time itself, facing down an enemy man has fought against since the beginning of the world. Jauja almost feels like some sort of Argentinian art-house reimagining of John Ford's The Searchers, with Mortensen on a kind of metaphysical quest to reclaim his daughter that ultimately becomes something much more. But what exactly is it? That question remains, sometimes frustratingly, up for interpretation. Jauja remains stubbornly confounding right to its haunting conclusion. It exists in a realm where time no longer has any meaning, and Alonso glides through time with a keen eye for atmosphere but absolutely no regard for conventional storytelling techniques. To look for a typical story here is to miss the point. Alonso was inspired by the death of a close friend, and he seems to almost get lost inside the haze of folklore and myth, as Dinesen wanders through the wilderness in a strange riff on the classic Western. He becomes enamored with the timelessness of folklore and legend, yet the film never seems to lose itself, even as we become disoriented, or even intoxicated, by its unusual beauty. A haunting existential work, often perplexing, always fascinating, Jauja is a dazzling experiment that never fully reveals itself, always hiding its meanings and ideas behind long takes and metaphors, but the result is undeniably mesmerizing, and Mortensen is tremendous in the lead role. It allows us to lose ourselves on the path the path to Utopia. We may not know how we got there in the end, but the one thing we know for sure is that the journey was more than worth it. 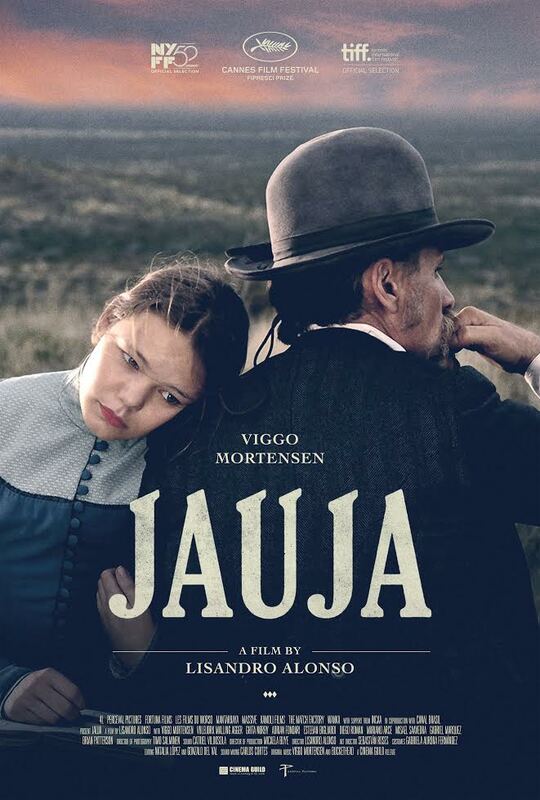 JAUJA | Directed by Lisandro Alonso | Stars Viggo Mortensen, Viilbjørk Malling Agger, Esteban Bigliardi | Not Rated | In Spanish & Danish with English subtitles | Now playing in select cities.